Start your day with a pick-up from your centrally-located hotel or Park Zrinjevac and hop into an AC vehicle for a drive towards Varazdin. Your guide will share interesting stories about Croatia and give you a great overview. Discover the baroque gem city of Varazdin with a licensed local guide on your walking tour. Visit one of the most beautiful graveyards of Europe. Enjoy the vistas on beautiful villas and palaces you will stumble upon while strolling the streets. 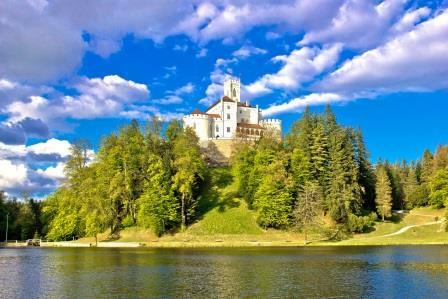 Visit a fairy-tale Trakoscan castle that dates back to the late 13th century. In the castle you will see valuable collection of paintings, furniture, and weapons. Embrace the natural beauty that surrounds you and have a stroll to the picturesque lake below the castle. Trg Nikola Subic Zrinski (park Zrinjevac) - next to the Meteorological station. This is a small display that shows temperature and barometric pressure on the north side of the park.